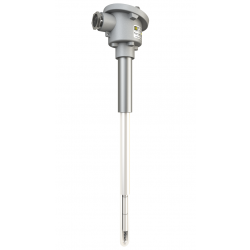 Specialized in temperature measurement in industrial environments, Pyrocontrole designs new high-accuracy temperature sensors for severe environments every day. For more than 65 years, Pyrocontrole has been developing highly technical products for advanced industrial sectors such as the Nuclear industry, Chemicals, Petrochemicals, manufacturers of construction materials (glass, cement, etc.) and Metallurgy. The vast majority of its activity involves drafting precise specifications, qualifying sensors and manufacturing probes for very high temperature (up to 1,800 °C). Pyrocontrole also proposes control equipment such as temperature controllers, electrical power controllers, paperless recorders and Human-Machine Interfaces with associated I/O Modules. Its expertise is acknowledged in France and has been exported internationally since the Chauvin Arnoux Group's acquisition of the company in 1997. Pyrocontrole's head office, now located in Meyzieu on the outskirts of Lyon (France), also houses the R&D infrastructure and the sales and marketing teams. "Pyrocontrole service" is now provided by an accessible, dynamic and professional team capable of finding suitable solutions to deal with any temperature measurement needs. They are backed by a high-performance Quality organization involved at every level, particularly in the very demanding Nuclear sector, and technical resources such as the COFRAC laboratory to guarantee the performance of the products delivered.